Good news, better plans and new year resolutions! 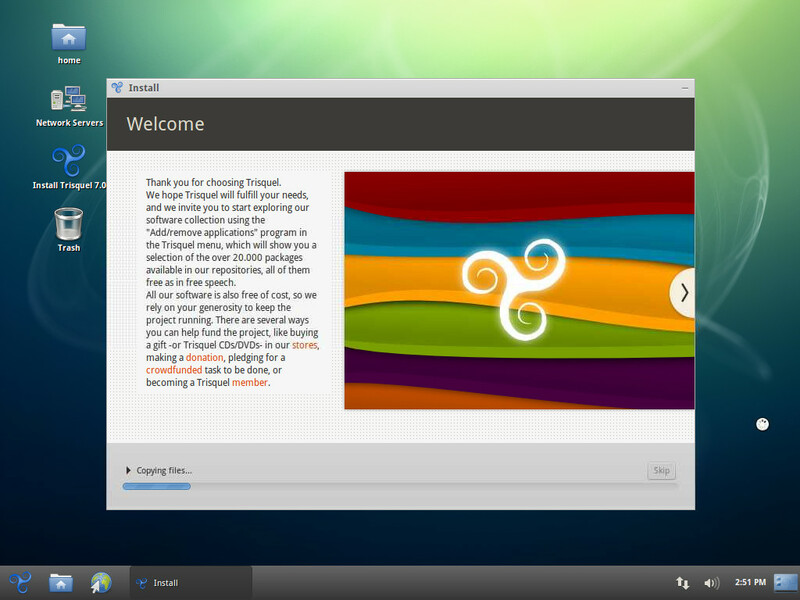 We write today wishing you all a happy GNU year and to announce a great milestone for the Trisquel GNU/Linux project. A couple of months ago, we were honored as one of the recipients of the Handshake Free and Open Source Software Community Grant, an amazing initiative of the Handshake Project which means that the Trisquel Association received an USD 100.000 donation. Return of the Freedom Fridays: development status, release plans and ways to help. Last week (on 12/08/17) we reinstated the Freedom Fridays, a tradition in which we hold periodic development meetings and post updates about the project at the end of each week. These updates were long overdue but since we can now consistently dedicate more time to the project, we hope to make fast progress on all fronts. New cycle, what we achieved and what's to come. 2015 was a year of quiet but continuous progress for the Trisquel project. With no major release scheduled for the period, we focused on improving the build system and server infrastructure, making the distro more reliable through quicker and more traceable updates. Our long time sysadmin Santiago Rodriguez took on the big task of taking the original build scripts that produce all our packages and fitting them into a continuous integration system and improved the build environment with pbuilder -for packages- and live-build -for images. As in previous years, Ruben Rodriguez will be representing Trisquel at this edition of FSF's annual conference LibrePlanet. The event will take place this weekend 21st-22nd of March at the Stata building at MIT in Cambridge, Massachussets. Ruben will give a talk entitled Browse in privacy and freedom with GNU IceCat. Special thanks to FSF for covering the trip expenses with a Scholarship, and to ThinkPenguin for doing so with the accomodation. As you may know, Trisquel is sovereign over its infrastructure. This means all of the services offered by Trisquel are managed by us, humans. We only rent the hardware and do everything else ourselves. Until now the git repositories were exported using gitweb and updated using shell accounts on the development box, but that has changed and we will be using gitlab for managing core repositories for the Trisquel project from now on. Trisquel will be present in the OpenEdJAM conference in San Antonio TX on July 25th to 27th 2014. The conference focus on software, hardware and other resources for a free and open education. In this talk, the project founder Ruben Rodríguez will explain why the only tools that should be used in a school are those that allow and encourage the students to use, study, improve and share them freely.